Trade Show Models have the best job promoting new beverages at major trade shows and making hundreds of dollars per day..
Every year, there are hundreds of new beverages being launched. Beverage companies attend trade shows to launch their new beverages to retail buyers and beverage distributors. These trade shows are similar to Fashion Shows for Fashion Designers that come out with a new line of clothing. Trade show Models need to be knowledgeable about the new beverages they are promoting and they must be able to communicate effectively. If you are promoting a new beverage that helps prevent hangovers, then you need to know about the ingredients in the product that prevents the hangovers. Trade show models must be attractive to grab a visitors attention and get them in the booth to learn more about the beverage. Trade show models are also commonly known as Booth Babes. Booth Babes are extremely fun to be around and they are usually the girls you see at conventions signing posters and having fun. Becoming a Trade show model is not difficult if you have the right look, love to socialize and the ability to sell a product. If you are easy to get along with and are reliable, then companies that need tradeshow models will hire you in a heartbeat. That's called being persuasive, and persuasive influential girls can make a whole lot of money because they benefit the client that hired them. There are thousands of beverage companies looking to hire Trade show models and most of them attend various industry Tradeshows such as the NACS show, Nightclub and Bar Show and Expo East and West Show. 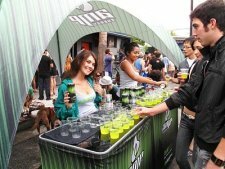 Working a tradeshow for a new beverage is exciting and it also allows you to work with the executives of the company. No telling what might transpire for your modeling career. The owners of the new beverage might fall in love with you and make you the face of their new brand. That means you get to be on their posters, travel to special events and get paid to sign autographs for hundreds of fans. You can also get more work if you do a great job working at a Tradeshow because other companies are extremely close to watch how much traffic you can draw to a booth. Does this look like something you should be doing? If you are tired of your same ole-boring job and would like to represent new and exciting beverages, then you need to become a tradeshow model. There are various ways for you to get a Tradeshow Modeling Job. Companies that need tradeshow models will contact an Agency that hires tradeshow models.